The offerings at this weekend's epic Burger Bash for NYCWFF featured incredible accoutrements from smoky bacon to truffle aioli dipping sauce, but a great burger is more than the sum of its tasty toppings. The offerings at this weekend's epic Burger Bash for NYCWFF featured incredible accoutrements from smoky bacon to truffle aioli dipping sauce, but a great burger is more than the sum of its tasty toppings. Here, participating chefs reveal their insider tips for creating the perfect burger. 1. Season confidently. 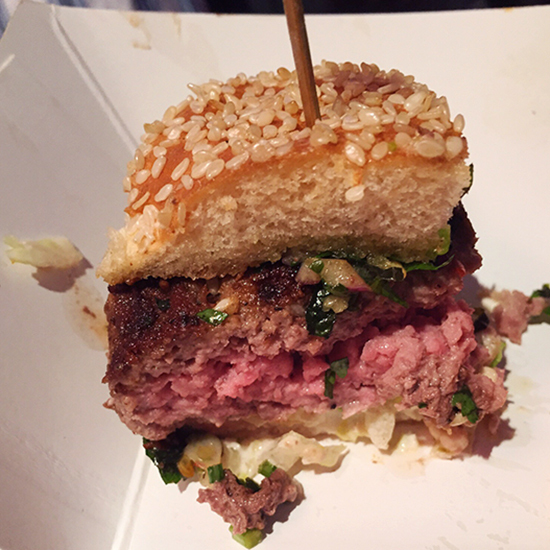 Star chef Marc Murphy earned the judges' pick of the night for his delicious Lamb-Marc burger (photo), made with tender lamb meat and fresh mint chimichurri. "It doesn't have to be fancy," says Murphy, "You just have to season with authority." 2. Go fattier. What's the secret to the incredible Brindle Room burger? "The slightly fattier 70/30 lean-to-fat ratio gives it that fantastic, juicy flavor," say the cooks. 3. Use mustard instead of ketchup. Shake Shack Culinary Director, Mark Rosati, won over fans with a juicy cheeseburger topped with crispy, beer-marinated shallots. "What makes our burgers really craveable is that they combine sweet, sour and salty all in one bite." But when he entertains for friends, his go-to condiment is always mustard. "Mustard doesn't cover anything, it only enhances the flavor." 4. Add crunch. For chef Franklin Becker (who took home the Burger Bash trophy in 2011), the key to a great burger is all about texture. "Caramelized onions mixed with pickles adds fantastic crunch," he says. Another favorite topping? "Rice crackers." 5. Over-the-top Toppings. Chef Robert Irvine's Bavarian Burger was topped with pork belly, onion-apple jam and pickled red cabbage. "It's everything you think about Oktoberfest in a burger," says Irvine.